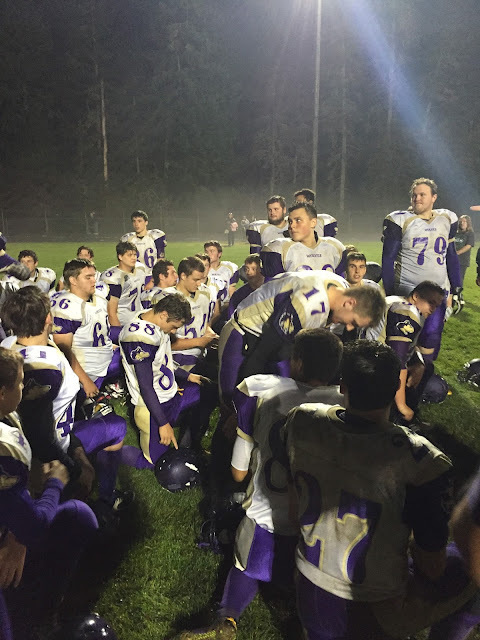 (Belfair) -- The Sequim High Wolves solidified their claim for one of the 3 Olympic League 2A football playoff berths after thrashing the North Mason Bulldogs 48-6 Friday night at Phil Pugh Stadium. The Wolves improved to 2-1 in 2A Division league play (4-1 overall), a game behind circuit co-leaders Olympic and North Kitsap (both 3-0). 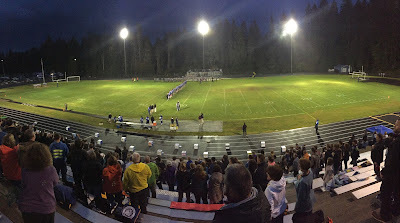 North Kitsap (4-2 overall) beat Bremerton 44-27 and Olympic (6-0 overall) throttled Kingston 46-7. Sequim sophomore Gavin Velarde visited the North Mason end zone 4 times, boosting his season total to 10 touchdowns. Velarde's accomplishments included 2 touchdown receptions from freshman quarterback Riley Cowan, an 88-yard kickoff return and a 73-yard scoring run from the Wildcat formation. Velarde tallied 87 yards rushing on 2 carries and 6 pass receptions for 126 yards. The evening began with the Wolves defense forcing a 3-and-out on the Bulldogs first possession with Sequim starting at its own 36 after a North Mason punt. Cowan was sharp in the first drive, connecting on all 4 of his passes, including a 26-yard scoring strike to Velarde. Thomas Winfield's PAT made it 7-0 Wolves with 7:29 to go in the opening frame. Sequim's defense was outstanding Friday, holding the North Mason wishbone attack to just 92 yards on 46 plays. After a yardless 4-play Bulldog possession, Sequim drove 64 yards in 8 plays and boosted its lead to 13-0 with 4:22 left in the 1st quarter. Cowan connected with senior Nick Faunce on a 17-yard TD pass. The PAT was blocked. The Wolves recovered a fumble at the North Mason 20 on the Bulldogs' next play from scrimmage and wasted no time taking advantage. Cowan found Faunce again, the senior making a 20-yard TD grab while sliding to his knees in the right corner of the end zone. 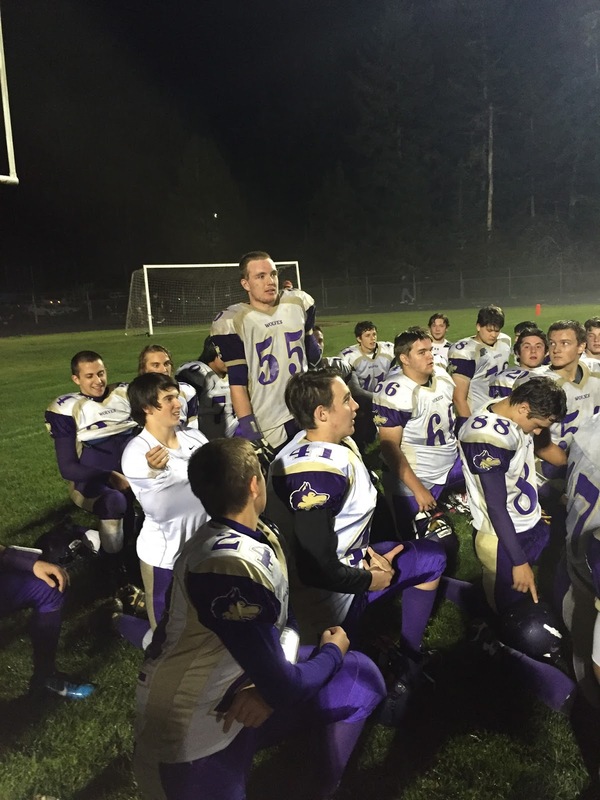 "He's an extremely good athlete," Sequim Coach Erik Wiker noted. "We've been moving him (Faunce) to receiver, as the need is there after we lost some (at the position) and he makes the current group better." Sequim was ahead 21-0 after Brandon Stamper ran for the 2 point conversion. 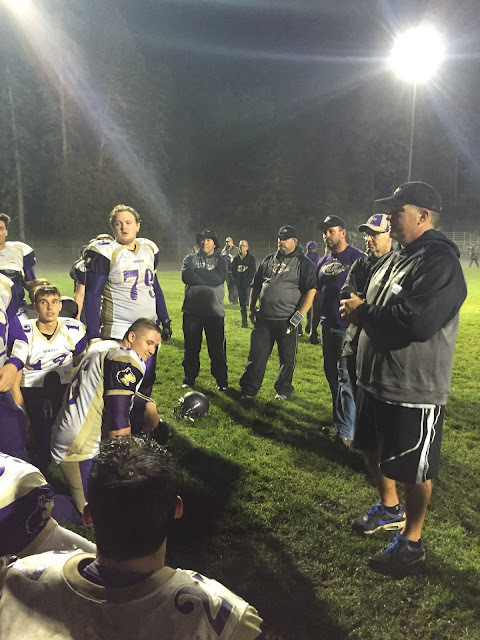 The Bulldogs exemplified the ability of the wishbone offense to churn out yards and eat up clock in maneuvering 65 yards (aided by 37 yards in Sequim penalties) in 13 plays over 7 minutes and 7 seconds. Fullback Sterling McIntosh crashed to pay dirt from 2 yards out with 8:43 until intermission, chopping the Sequim advantage to 21-6. Any momentum by North Mason evaporated after 14 seconds, as Velarde fielded the ensuing kickoff on the run at his own 19 and sprinted to an 88-yard touchdown return. Mark Feeney's 2-point conversion run made it 29-6 Wolves at the 8:29 mark of the second quarter. Any doubt of the evening's outcome disappeared in the final 2:09 of the first half. Sequim scored three more times, a pair of Thomas Winfield field goals sandwiched around a 50-yard scoring pass from Cowan to Velarde. Cowan finished the night completing 16-of-27 passes for 294 yards and 4 scores. 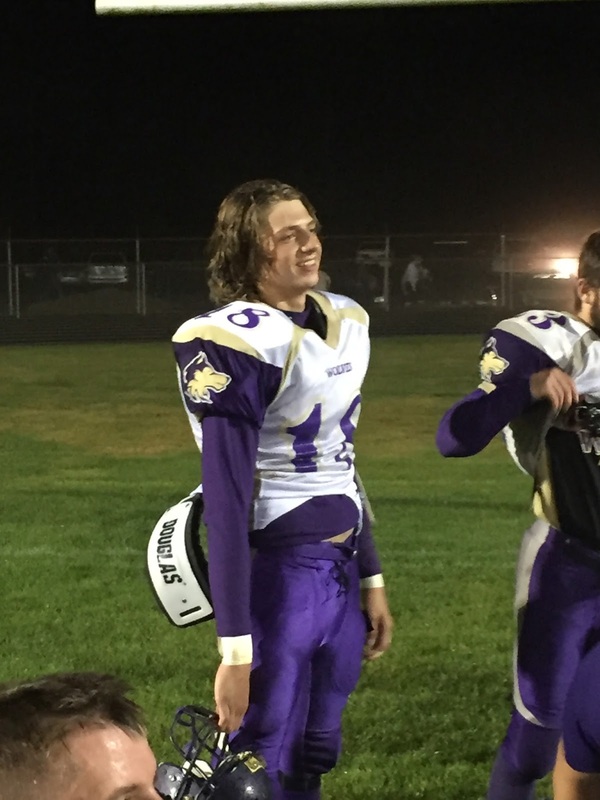 "He's a really good freshman quarterback who's studied the game a lot," said Coach Wiker. "He's an awesome kid and it's good to see him do well with an older group." Cowan has thrown 8 scoring strikes this season. A fumble recovery by Josh Benson led to the second Winfield placement, which sailed 21 yards through the uprights as the first half clock expired, sending the guests to the locker room ahead 42-6. The only points of the second half came with 1:51 remaining in the third quarter. Sequim started a drive at its own 27 as Velarde lining up behind center in the Wildcat formation. The speedy sophomore took the shotgun snap and sailed 73 yards around left end, faking out the last North Mason defender with a nifty juke near the Bulldog 35 and scored standing up for a 48-6 Sequim lead. The Wolves offense rolled up 429 yards in 48 plays, averaging almost 9 yards per snap. Coach Wiker had kudos for a number of Wolves, lauding senior Kane Stoddard, "as probably the defensive MVP of the year so far." The coach also saluted sophomore lineman Mason Larsen and junior James Thayer, along with his trio of running backs, Arnold Black, Mark Feeney and Brandon Stamper. 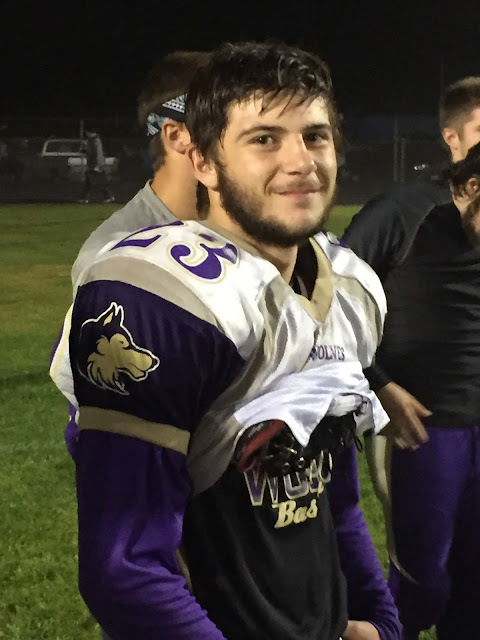 Wiker says the Wolves treated last week's cancelled game against Centralia as a bye week, with players and coaches taking a break for the weekend. The coach says the team benefited from two weeks of practice to add a number of variations to their offense that were used against North Mason. The Rainshadow Rumble looms Friday night for the Wolves homecoming game against Port Angeles. The Roughriders (0-3 in 2A Olympic League play and 1-5 overall) lost to the Black Hills Wolves 34-0 Friday at Tumwater. Port Angeles has a 2-game winning streak against Sequim on the gridiron, knocking off the Wolves 20-14 in overtime at Civic Field last year. (The PA skein is 3 games if you include the Riders' 6-0 mini-game victory over the Wolves in a league playoff at Silverdale Stadium that ended the 2014 season). "They're going to come out fired up", Coach Wiker said of the Roughriders. "It would be what I would call their Super Bowl, it would make their whole year if they beat Sequim at Homecoming." "We're going to keep plugging along and try to get better every week," Wiker noted. 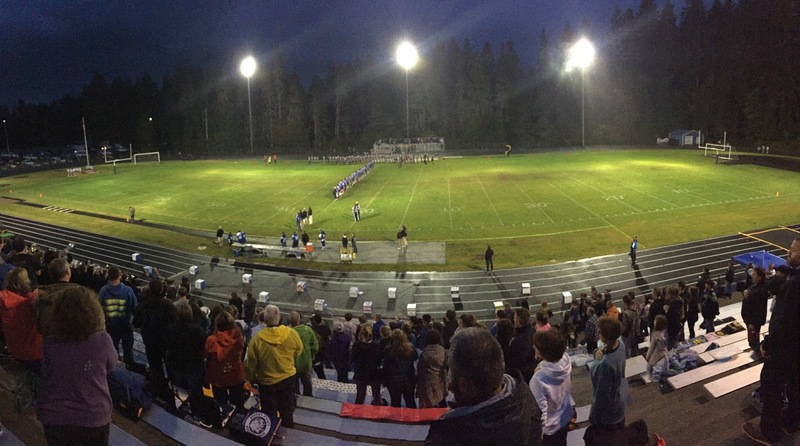 Friday's Rainshadow Rumble game will be broadcast live by Newsradio 1450 KONP with veteran play-by-play man Scooter Chapman beginning pre-game coverage at 6:30 p.m. with the kickoff at 7 p.m. on the radio at AM 1450 or FM 101.7 and online at www.konp.com. Seq - Riley Cowan 1-(-5), Nick Faunce 1-(-10), Gavin Velarde 2-87-1TD, Arnold Black 6-26, Mark Feeney 3-14, Brandon Stamper 3-16, Dillon Smith 2-1. N.M.- Dylan Tupelo 5-12, Robert Thomas 2-(-1), Preston Poulton 5-13, Codey Myrick 3-7, Austin Williams 3-3, Trey Fisher 6-2, Sterling McIntosh 8-23-1TD, Tristin Mullins 2-8. Seq - Riley Cowan 16-27, 294 yds, 4TDs; Nick Faunce 0-2, 1INT; Johnnie Young 1-1, 6 yds. N.M.- Preston Poulton 5-12, 48 yds. Seq - Noah Christiansen 3-58, Ben Hughes 1-9, Nick Faunce 4-62-2TDs, Gavin Velarde 6-126-2TDs, Rudy Whitehead 1-18, Brandon Stamper 1-21, Curtis Gorr 1-6. N.M.- Eric Jones 2-46, Trey Fisher 1-(-2), Tristin Mullins 2-4.